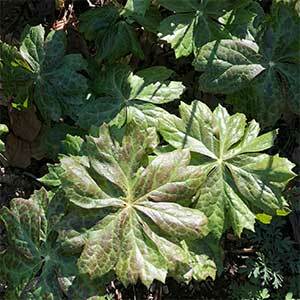 With attractive flowers and foliage, Podophyllum peltatum is a woodland plant commonly called the Mayapple. It is excellent in a areas beneath tall deciduous trees where it can be allowed to spread to form a large clump. Although the flowers are attractive it is probably not really a feature plant, however well worth a spot in the garden. The flowers are followed by small fruits (mayapples) and these are poisonous when not fully ripe. As they turn yellow and slowly ripen they are reported to be used to eat fresh or make jams and jellies. The seeds, foliage and roots are not edible and are poisonous, and we do not recommend eating any part of this plant due to the poisonous nature. Plant in a humus rich well drained soil. Water during dry periods over spring to summer. This a plant that spreads by underground rhizomes, it can also be propagated from seed. Common Name – Mayapple, Wild Mandrake. Height – To around 30cms (12 inches). Spread – To around 20cm 8inches. Flowers – White with six petals. Foliage – Mid to deep green and deeply lobed.